"Fearless," which has traveled the country with its crisp, arresting photographs of openly queer high school and collegiate LGBT athletes, will be residing in Tarble Pavilion until November 14. It is definitely worth a look. “Fearless,” sponsored by the Sager Fund, is an exhibit that applies perfectly to Swarthmore — here, athletes do not necessarily represent one demographic, be it race or sexual orientation or gender identity. Jeff Sheng, in his artist statement, emphasizes his openness and willingness to photograph anyone who self-identifies as LGBT and continues to play on their athletic team. On a coincidental note, as LGBT athletes gain more prominence and exposure in the media, the timing of this exhibit could hardly be more ideal. Each photograph conveys the courage and the strength, both physical, mental, and emotional, of its subject. The athletes pose either in or near where they practice their craft: swimmers stand or sit by a pool, a runner is poised on a track, a tennis player stands on a court with her racket in hand. The photos are taken from such an angle that the athlete is given a monumental, larger-than-life status and physicality. The most impressive of photos are those taken indoors, where the athlete is dramatically lit via spotlight. Each athlete holds our gaze unwaveringly, refusing to let us look away. Accompanying several of the photographs are statements from the athletes themselves regarding their experiences. Some of the stories are positive experiences that athletes had after coming out, largely told in the form of essays that accompany their photograph. 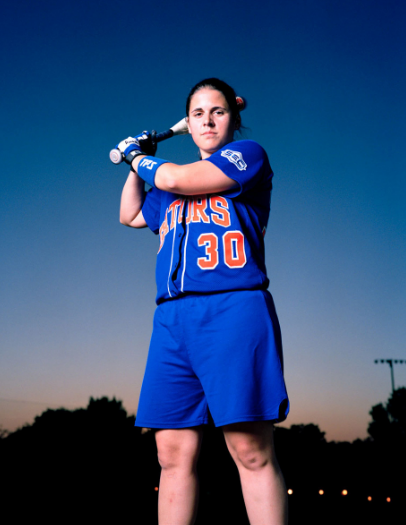 One of the most powerful (and well-known stories) is the story of Andrea Zimbardi of the University of Florida, who was allegedly cut from her softball team because of her sexual orientation. Her story is told in newspaper clippings that surround her portrait (see below), where Zimbardi stands against a darkening sky, holding a bat over her shoulder, decked out in vivid blue Gator regalia. Zimbardi’s face is serious and resolute: she will not back down; she will not be cowed or bullied due to her identity. I do wish that more of these portraits had been accompanied by the corresponding athlete’s story. 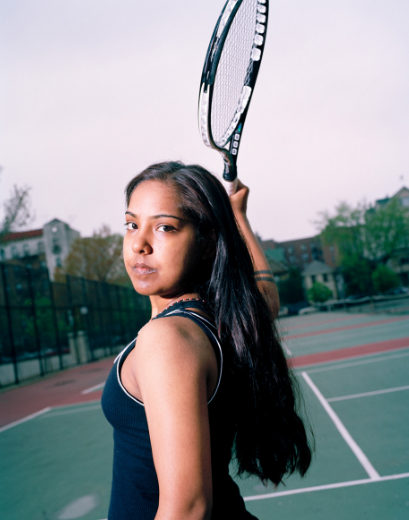 As a gay man of color, Sheng has consciously also included athletes who often are not given due mainstream representation in the media: many of the students are women, people of color, or are trans*, though arguably the photographs selected for this show could have been more inclusive of the aforementioned demographics. While in theory the location and timing of this exhibit could not be more perfect, in practicality, it should have been exhibited somewhere else. It's too easy to walk through the Pavilion and miss this exhibit because there is already so much on display — Swarthmore team photos, pennants, trophies, etc. Background noises from the basketball court, idle chatter, shoes squeaking on the linoleum — it's definitely not an ideal way to see an art exhibit. As it is, however, “Fearless” is a must-see. It takes a group of people who even still struggle to find acceptance, love and respect and portrays them in a heroic and powerful way. Looks like a great exhibit with a wonderful message. 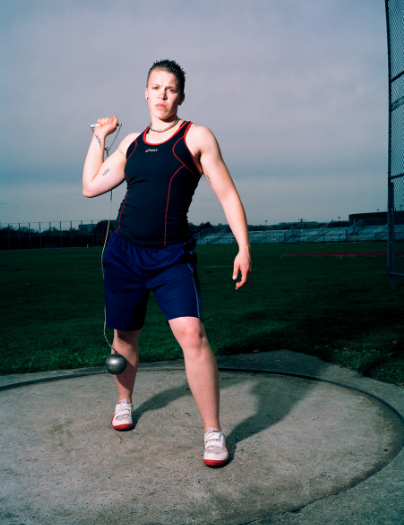 The photos convey the determination of these subjects...both as individuals and as athletes. I hope people go see it while they get the chance.